Since today is St. Patrick’s Day, my head, heart and belly turn to one of my favorite recipes shared by my friend Sarah. I first ate this goat cheese dip on St. Patrick’s Day a few years back and it was affectionately dubbed “Erin Go Bragh-less Dip.” Today, this dip has become a St. Patrick’s Day staple alongside “Wee Widdle Wienies” (a.k.a. Lil’ Smokies), green Jell-O shots and green beer. Growing up a “Patrick” meant Mom celebrated St. Patrick’s Day with me. It was kinda like having a second birthday each year, although any treat I received was usually small and meaningful. Mom usually wore a St. Patrick’s Day pin and it was a fun day for us both. While I was hardly saintly growing up in a house of four boys, Mom’s love for us all was larger than any known pot of gold. 1. Mix together the goat cheese, cream cheese and garlic in a medium-sized bowl. Check the taste; add salt and pepper if you’d like. 2. Spray a small glass bowl or copper mold (about 3 cups in size) with non-stick cooking spray then line the bowl with plastic wrap; this helps remove the dip when you’re ready to serve. 3. 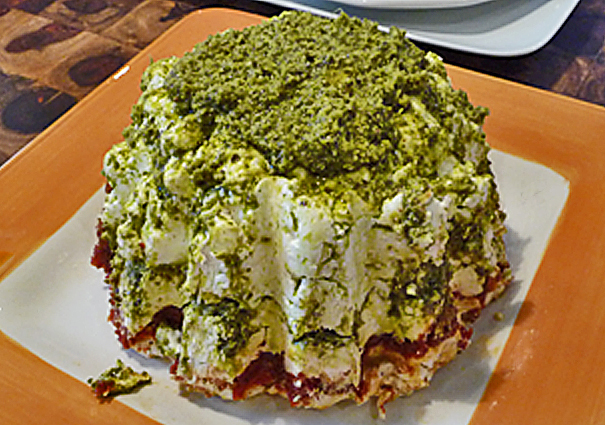 Put ½ the pesto in the bottom of the lined bowl then place about ⅓ of the cheese mixture on top of pesto. Follow with the remaining pesto and another ⅓ of the cheese mixture. Add-in the sun dried tomatoes then top with the remaining ⅓ cheese. Place plastic wrap over the top of this and refrigerate for at least 2 hours and up to 4 days. 4. To serve, invert bowl onto a serving dish. Carefully remove then discard the plastic wrap. Decorate the top o’ the dip with fresh herbs if you want. Serve with crackers or baguettes. ♥ If you find the dip is hard to remove from the bowl, try setting it in warm water for a few seconds… or microwaving it (if the bowl is microwave friendly). ♥ I like topping the dip with fresh finger-torn basil. And you can always drizzle the top with olive oil, but only use the good stuff. ♥ Nobody likes broken crackers! Make sure and accompany your spread with some dip spreaders. You’ll find the dip will soften as it sits out, but it won’t last long! Trust me – your friends will be green with envy for this recipe! ♥ Like clovers? Try this recipe out (scroll to bottom).